Interests - All things pink and sparkly, massage, music (especially Disney songs) Arts/crafts that get messy and have lots of different sensory feelings! Having her face painted / getting her nails done .Listening to stories / stories on CD (hearing all the different noises). Holly was born fine but when she was 8 weeks old she suffered a series of respiratory arrests and ended up on a life support machine for 3 weeks. The doctors then decided that it would be best to turn Holly’s machine off as there was nothing else they could do for her and her chance of surviving was nil, so we had Holly christened and everyone came in to say their goodbyes. Then we turned Holly’s machine off and for the next 24 hours she battled her way through and the next thing a miracle happened and Holly opened her eyes. That was the sign she gave us to tell us that she was prepared to fight and who were we to argue with her. 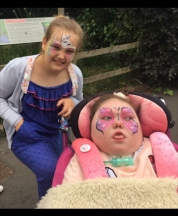 The doctors told us that Holly would not live for very long as she had been left with cerebral palsy, epilepsy, chronic lung disease and oxygen dependent. She had to have a tube fitted in her stomach so she could be fed and she had a visual impairment, but if Holly was prepared to fight then so were we to make sure she lived a very fulfilled and happy life for as long as she was with us. Over the next few years Holly spent a lot of time in hospital and on many of those occasions she ended up on a life support machine in intensive care. This was due to many things but the most frequent was a chest infection that would very rapidly develop into pneumonia for her. On every occasion we were told that the outcome was very bleak but what the doctors didn’t realise is that Holly is a very brave and strong little girl who has a passion for life and is determined not to let anything beat her. In the last 12 months, Holly’s breathing started to deteriorate and for many months we were going back and forth to the hospital to see if they could help Holly, but every time we tried a new medication there was no success, so Holly got to a point where she could not go on like that any longer. The doctors told us that she would have to have a tracheostomy fitted as there was no other option, so they took Holly down to theatre and inserted a tube into her throat to help her breathe, and as usual, Holly came round from the operation with a glint in her eyes. Now it’s like she has been given a new lease of life as she can breathe a lot easier. Holly has a lot to go through each day and she has a lot of epileptic fits every day, amongst other things, but she never complains and she is the most inspiring and brave person I will ever meet. Holly doesn’t get a lot of opportunities to socialise or make lots of friends which is why I think Holly will love receiving post and having it read to her and also being able to make lots of new friends. So sorry for being a little late on our updates, life has been so so rubbish this year. As you all know Hols was taken into hospital in January and we are still trying to get out the other side. The last update I think I told you about Hols kidney stones and that it was horrific. The pain she was in was so bad she had to have breathing support and for us as a family it was heartbreaking to see her suffering day in day out for so long. While I battled away with everyone and anyone that would listen to me to get them to hurry the operation up. In the 16 wonderful years of looking after Hol this has had to be one of the biggest challenges I’ve faced and as a family it’s tested us to the limit. We had the operation and they removed all the kidney stones in both kidneys, but while doing the operation they broke both her legs so not only did she leave hospital with clear kidneys and trauma to deal with, but also a pink and purple full leg casts. 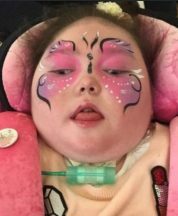 We have been working very closely with the palliative care team, as Holly has been so poorly over the summer and everyone has been really concerned, as she’s needing lots and lots of strong painkillers and various other medicines to try and keep her balanced. How things stand at the minute, we are still very concerned about her and we are still nowhere near back to getting Hol near to where she was before we went in hospital in January, but we are praying every day for our little miracle to arrive and take all this pain away that she’s in. We are heading to another meeting first thing tomorrow to discuss Hol again with the neurologists and the respirator team to see if we can help her anymore than what we are doing. Ruby has been a superstar throughout all of this, even though we got home for the summer, we had to cancel all our summer plans and our holiday that we had desperately been looking forward to, as Holly has been too ill to leave the house. She’s so mature and I’ve got to say I couldn’t be any prouder of the two of them and how they have coped, dealing with everything this year. I’m so sorry I’ve not been posting many updates,it’s because life has been so rubbish, so I’m hoping things are going to become more stable for us as a family very soon and I’ll have some happy posts and pictures to update you all on. Thank you for supporting the girls it really does lift us all xxxxxxxxxxxxxxxxx. Holly is heading for her sweet 16th birthday in December and its getting very exciting. She has had a busy summer, she went off to an international guide camp in Leicester and camped with all her friends, which is always a challenge for us, but she gets so much out of it, it makes it all worth it. She had a few episodes of fractures over the summer as her osteoporosis continues to get worse. She also is having lots of problems with her bowels and we have had to have a few emergency meetings with the palliative care team. She also had a great week away in the summer to Bendrig Lodge in the Lake District,where we managed to do lots of fun activities as a family, including sailing and climbing and caving. These times are so precious when we can all do activities together. Ruby is super excited at the minute, as its her big 10th birthday on 26th October and we are planning a neon disco party. She has also been super busy with us over the summer, but also continues to be a great help to us over such a busy time of year. She had a bit of a run in with a basketball over the weekend and dislocated and broke one of her fingers!!!! She was super brave. Holly has had a busy month with lots of hospital visits with the ongoing problems with her bowel!! She’s also had to start a new medicine that is giving her some rubbish side effects, but she really needs the medicine so we are a bit stuck. The girls had amazing post over Easter and this month and the letters that arrive are so lovely to hear how everyone else is getting on. We’ve all just done a run for Holly’s hospice today which was lots of fun and Holly got a lovely medal. We are getting super excited for the Post Pals party now and can’t wait to see everyone again. I really don’t know where to start with this update we have just had the most amazing time in Chessington World of Adventures with Post Pals. We’ve done lots of fun activities like cuddling a panda bear, to meeting Rapunzel at dinner and of course Ruby loved all the rides, I think the cobra was her favourite. With lots of help from the Post Pals team we even managed to get Holly on the princess carriage ride which was so special as Holly doesn’t get to go on rides. While away, Holly was struggling a little bit with lots of nasty seizures but we didn’t let that spoil her fun. Over the last few months Hol has been struggling more and more with her bowel and bladder and they want to do surgery in a couple of weeks!! We are very scared as every time she goes under general anaesthetic it’s very dangerous for her as her lungs are so weak now. Thank you to everyone that’s been sending lovely post through to the girls this month. Ruby has been quite poorly too, spending some time in and out if hospital due to her getting salmonella and she’s still recovering now. As always we are so grateful to you all for the love and thoughtfulness you show to the girls, so massive thanks and lots of love from us all. Holly has had lots of hospital appointments as her bowel and bladder have more or less stopped working very well and the specialists want to do surgery very soon to fit a colostomy and a permanent catheter to help fix the problems.But it’s really dangerous every time Holly goes under anaesthetic, so I’m finding it difficult to agree a date at the minute, as I’m feeling quite scared about it all. We made it to guide camp with Hol in July, but had to cut it short and rush her back to hospital as she came down with a chest infection and has not been great, as her lung capacity is so tiny so she struggles to maintain herself. Thankfully after a few weeks hard work and lots of determination from Hol we are through to the other side and can start enjoying the summer holidays. We have come down to Devon for a little break and I’ve got to say the girls are loving every minute of it, but it’s very hilly, so mine and Gary’s back is not enjoying all the pushing up and down. Haha. Anyway, massive thanks guys for keeping my girls’ spirits up and always making then smile. As always, we really appreciate that you think of us. Happy holidays everyone. I hope the sun is shining for you all. Holly has been having another tough month, as she has got another broken knee. Unfortunately her osteoporosis has become more and more of a problem for her over the last month. We are waiting to go into hospital next week for a special scan, to see how many fractures she has got at the minute, all over her body. We had a nice time at Easter and we got out and about on Good Friday, but Holly was very cold and couldn’t leave the house for the rest of the weekend, as her temperature was dangerously low. We had a fun time yesterday though, as I took Holly and Ruby to their first ever book signing. Ruby loves reading and Holly loves listening, so it’s a great combination ha ha.We went to meet Holly Smale yesterday and she signed their books, so they are on a mission now to get David Walliams to sign there books, as they love reading them. Well we had an eventful Christmas, as Holly had a broken knee and was in a cast from the top of her leg down to her toes. It happened as we transferred her from her chair to the bed, and she has now been diagnosed with brittle bone, from the results of the x-rays and scans.So we are just waiting to see a specialist about her starting a new treatment, to make her bones stronger. She was delighted that Father Christmas delivered her a new Disney Princess charm for her Pandora bracelet and a portable music system so she can listen to music and enjoy all her favourites like Little Mix and Megan Traynor with Ruby. Ruby was so delighted with the whole of Christmas and she was so excited to keep receiving her elf post and couldn’t wait to take each new letter to school, to read to her class. All Ruby wanted was the David Walliams book collection, as she is a massive fan of his now and loves reading, so she’s started collecting the fairy books now too and the horrible history books. We were over the moon with the beautiful cards we received in the run up to Christmas and we can’t thank you all enough. Holly is desperately trying to stay warm as we get through January. Ruby is a little nervous, but very excited to be going on her first Brownie camp next weekend. Holly has been too sick to get to get Guides lately, so she had a lovely surprise the other night when the Guides turned up at our house to do a Guide badge, with Meg which was so much fun. Happy December! We have had a busy couple of months; Ruby won a well child award and she was invited down to London to meet Prince Harry! However, the day before we were due to leave Holly took ill, so it was touch and go if the hospital were going to let Holly travel. I decided to find a way and so we spoke to a doctor who helped us get a portable device, so that we could give Holly IV medicine on the go!!! We are so glad we all got to go to the awards, as it was an amazing experience and Prince Harry was so lovely.He sent the girls a letter after we got home, to say how much he appreciated the gift that Ruby had made him. We eventually got over that chest infection, but Holly is having major issues of pain in her bowel and also not being able to control her temperature. So it is proving difficult to get out and about with her, but every good opportunity we get, we are off. We loved receiving our popcorn pan from Candy Chaos, it was so much fun and we really enjoyed doing it all together. The girls have received some beautiful post from all you very kind people, so thank thank thank you so much for thinking of them. We are just heading into December and the girls are very excited that Father Christmas will be heading our way soon and I’m just praying that we can stay out of hospital for it. We are busy planning Holly’s birthday this week and as her special present I took her to Lapland UK, as I’ve always wanted to take her to Lapland and I’ve got to say it was so magical and she loved it. Holly will be 14 this week, which is such a massive milestone for Holly, as they said she wouldn’t reach her first birthday.Also being so poorly the last year it feels really emotional, but we are so so thankful. The girls are busy making lists for Santa and hoping they are on the good list ha ha!! We have been so busy since our last update it seems like life never wants to slow down. We had a great summer and enjoyed some time while Holly was well enough to travel, the best bit being that we travelled over to Disneyland in Paris and it was the best week ever. The girls had such a magical time, they really enjoyed meeting the princesses and they were delighted when Prince Charming came out of the parade to give them a kiss. Amazingly Holly must have been so happy to be at Disney, her oxygen levels reached 100% for the first time in months. Holly has been battling another chest infection which developed from catching a cold.She has had a difficult couple of weeks, but we have managed to care for her at home with the help of our acute response team. We were delighted to receive a letter a little while ago to tell us that Ruby had won the WellChilds Nation award for most caring female, for all the help she gives to her big sister. We are so proud of her and the best bit is that we are all off to London next week, where Ruby will receive her award and she also gets to meet and spend time with Prince Harry!! To say she is excited would be an understatement!!!!!! Thank you all for your post and lovely parcels that the girls have received, someone sent us a beautiful H and R decoration, which the girls have put in their bedroom. We really appreciate all your time and thoughtfulness that you show to us all the time and are so grateful for everything. I’m so happy to be posting that Holly has had a good couple of weeks and that means she has been able to start living again. It all started with the amazing Post Pals party, which is certainly a highlight of our year. I can never get over how everyone is thought of so individually, no matter what their abilities. They have something for every child there, it really is a day that dreams are made from and of course this year the fabulous Jamie was there with his candy! Oh my goodness, I couldn’t believe my eyes when I saw it all! What Holly didn’t know was that after the week of the party we had planned a surprise trip to Disney for her. This was because she had been so ill. However, the week before we were due to go she took ill again, so I was really nervous about it. Thankfully she improved enough for us to go in the end though. The trip was so magical from start to finish and we were amazed how well Holly responded to the trip. Holly and Ruby had a lovely time and got dressed up as princesses and went for dinner. Just after we returned home, we had a call to say Holly’s bone marrow isn’t producing white blood cells at the minute that fight off infection, so we are busy sorting that out at the moment. Holly has been having a turbulent couple of months. She has lost the ability to control her own temperature which is causing lots of problems and also stopping her from leaving the house a lot of the time as it is cold outside! She has also been having lots of problems keeping her oxygen levels up and needing more support, so we had meeting with the palliative care team and our hospice this week and were told that they think there has been a deterioration in her ability to breathe by herself! Not the greatest news and also a very worrying time for us as we don’t fully understand the consequences of this yet. She hasn’t been able to go to school for nearly a year now which is really sad as she loves mixing with all her friends and doing lots of fun stuff. I’m currently trying to arrange a surprise to take her to Disney in Paris, so I’m very excited to get that all organised, but it’s very difficult with oxygen plus insurance. Hopefully we will get there with it all soon. Holly is spending most of her weeks at hospital appointments at the minute, so it’s lovely for her to receive all the lovely post and letters and cards, as it gives us something else to focus on. Ruby has been doing lots of work at school lately as she’s got her sats tests coming up, but she really has no idea what they are so she’s not stressed about them at all! I’m sorry my updates aren’t as happy as they usually are, it is just that I’m finding it really hard to be so positive lately with all these tests coming up this week. Things are still very hectic here and Holly is still having lots of problems due to her being so ill in hospital recently. It has had a major effect on her, we are struggling to control her temperature as she keeps dropping to hyperthermia levels, plus her oxygen sats are very temperamental too. We have had to have a meeting with the doctors this week as they are concerned about the signs she is showing, they think the right side of her heart has been left a little bit damaged from all the infection in and around her lungs as she is having problems clearing her fluids. We are very unsure at the minute whether this is how Holly is going to be now or if we are still feeling the after effects of her recent admission. She is an amazing little superstar and is battling through as she always does. It’s Holly’s birthday next Saturday and she will become a teenager which is a very important day for us all. However, with everything that’s been going on I haven’t had a chance to arrange a party or anything so I’m hoping to organise something nice for her this week. Ruby has been back to hospital for her MRI scan so we just have to wait for the results now. The girls are super excited for Santa coming. I’m sorry for the lack of posts with our thanks for all our amazing post and special gifts, as they really do brighten our days and we are truly grateful to you all. Just a quick update as life has been really hectic lately. Holly has been very ill and was rushed into hospital 3 weeks ago. When we got there we realised she had hypothermia, double pheumonia, plus a fluid infection around the lungs and septaceimia, so she was put on Cpap and it has been a very worrying time for us all. The doctors said they thought we might not bring her home this time as she was so poorly but thankfully with lots of hard work from the wonderful team at Alder Hey and the amazing Holly herself, she turned a corner. She is still not close to being herself and it’s going to take lots of TLC to get her right. Ruby was very upset by the whole situation and was finding it all hard to deal with, then all of a sudden she took ill herself and was also admitted to hospital with a very nasty water infection and had to be catheterised and put on IV antibiotics as she was in so much pain. This meant we had two daughters on two different wards which was very difficult for us, but thankfully Josh is fully Trachi trained and he floated between both girls so that me and Gary could do shift changes between the girls. Holly is having a really bad time at the minute! Her epilepsy has become uncontrollable and she’s having lots of different medicine changes to try and settle her down. We are hoping to see some improvement very soon. She’s got lots of important hospital visits coming up this week and next, as she’s got to go and see a bowel surgeon and someone about her upper limbs as her scoliosis seems to have got worse. She had an amazing time at Guide Camp and it’s something I don’t think we will ever forget. She joined in with lots of new activities, she went on a kata canoe with all her friend which was great fun and she also was one of the first Guides to complete her challenge badge. She took part in flag down with people from all over the world which was amazing and she went to a disco! I think she quite liked all the dancing with her friends! Thank you for all the post we have received from everyone I’m sorry my updates aren’t as often as I’d like. Ruby is very excited to be going back into Year 2 in school next week and is very excited to be with her new teacher. Josh has had a very exciting time lately as he went for an audition and he has started filming for a part in a show on CBBC called The Four O’clock Club, so I’ll let you know when he’s going to be on! Hi everyone, well our household has been very busy and hectic over the last couple of months! Holly has been having lots of problems with her bowel which is still on going and it’s causing her to be in lots of pain. We have started new medication but unfortunately it hasn’t worked so she has now been referred for an urgent referral to see the top bowel surgeon at Alder Hey. Her epilepsy is causing her to have lots of problems too and we don’t seem to be able to get her seizures to settle, but we have been changing all her meds so hopefully we will see some improvement soon. She has been working hard in school when she can get there and I had a great parents evening at the end of term where the teacher told me she’s top of the class so I’m a very proud mummy. Holly is just about to embark on her next adventure – we are going to guide camp tomorrow with her guide unit and we are camping at Windsor Great Park!! Her unit are going for a week but Holly would never be able to cope with that so we are going for two nights and camping in a tent! Yes, that’s right, a tent! I have had to send quite a few emails to get us sorted as I don’t think they know or understand how much equipment Hol is going to turn up with! She never travels lightly! It’s all very exciting though as I never thought I would see the day she would go camping with her friends, but I’m also very scared! I’m sure we are going to love our new adventure though. Ruby is her usual bundle of energy and looking forward to her break from school so much! She had a go at horse riding last week and loved every second of it. She is also attending a multi sports summer camp which she is loving. Josh turned 16 last week and so he will now be moving on from Post Pals but he wanted me to say a massive thank you for all the post he has reviewed over the years. The amount of smiles his post has created is endless and he appreciated each and every single one of them. He is going to college in September to pursue his love of acting so hopefully one day you may see him on the telly. Anyway, I just want to say a massive thank you to you lovely, lovely, lovely people, that continually support us as a family all year round. We love our post as it brightens up our days. We are sending you all massive hugs and kisses and we hope you have an amazing summer! Josh is now 16 and he would like to say thanks for his post over the years. Please continue to send post to Holly and Ruby. Hi everyone I’m sorry for being so quiet lately, we seem to be spending more and more time at Alder Hey every week. Holly has been having a rough time lately as her whole body seems to have gone out of sync, which we think is due to her age! She has been suffering lots with her Epilepsy so we have been trying different medicines to try and get the seizures under control. We have been having major problems with her bowel and bladder too which has resulted in us having to start catheterising her to empty her bladder and we are talking to bowel surgeons about the best management for Holly. She has also just started having botox injections into her muscles to help her move her limbs as the tone is becoming quite tight and her skin is breaking down in some areas. All in all she has been having a rubbish time lately but I’m hoping with all the new management plans things will start to improve. It would help both her and all of us too, because it really does have an impact on all of the family, as I see us having less and less time every day for Josh and Ruby. Josh is doing his GCSEs at the minute so it is a really important time for him and I do wish there were a few more hours in the day so I could support him better. I hope you are all well and thank you again from the bottom of my heart for every card letter or gift that arrives for my children. Holly and Ruby have so much fun together opening the post and Ruby feels like she is helping her big sister and they can have fun together. Hi everyone! Sorry for the late update but life has been very hectic as usual in our household. Holly’s chest became bad in August and it has taken her a long time to recover from it, she has had a few short trips to hospital as her breathing has really been affected by it all. Her respiratory team are a little concerned by it all now so she is going into hospital again tomorrow to have some in depth tests carried out on her breathing as they are unsure whether she may need some support to help her breathe. I’m hoping not as life is hard enough for her and us as a family with everything that we have to fit in a day, so to add something else will only make things harder. We are just waiting on some results from her bloods as she has been exhausted lately but we think it may just be the infection has taken it out of her. She has managed a few fun things with her guide group though in-between all this, she had a fun sleepover with them all and then took part in a lovely remembrance day parade, it was so lovely to see her with all the other girls. She’s getting excited now as it is her birthday in December so it is another major milestone in her life that we are so grateful to see every year it comes around. Ruby has been very busy lately, it was her birthday and she turned 6 in October. She had the most fun with all her friends as we had a pop-star party which Holly loved too with all the music. She has developed a big love for Lego so she was thrilled to get some birthday money and off she went to buy herself a set from the Lego shop – it took at least an hour to decide! She said her best card was a One Direction card that had her picture on with the band and she’s stuck it right next to her bed. Josh has been busy revising for his GCSEs lately so we are relieved that they are over for the time being. He has joined an acting class once a week and really enjoys going, he is hoping to go to college next year to study it but he has got to go through lots of auditions first so we are hoping it all goes well. I’m so touched that even though I don’t get time to update as often as I should that you still don’t forget us. We are so grateful for your support and when that letter arrives and I get to read it to Hol and we forget all the other rubbish stuff we have going on some days, it is just fab. We can’t thank you all enough really and just as I’m writing this an elf package has just arrived addressed to Ruby and I know that her face will light up when she comes home from school. She just loves her magical Christmas letters and takes them all to school to show everyone. Hi everyone, well I’ve had a bit of a up and down month. I’ve been having lots of problems with my bowels but my doctor has given me some new medicine to make that better and I am waiting to go and see a new doctor. I am visiting a new school at the minute as I go to senior school in September but I am a little bit worried and so is my mum and dad – I can just tell! I am liking the people though and I am looking forward to making new friends. The only thing I don’t like is the uniform, it is yellow and green and anyone who knows me will know that those two colours will clash terribly with my bright pink wheelchair. I had such a lovely time at the Post Pals party it was so much fun and again singing hands were amazing!!! Me and my mum love the picture that the lady drew of me and my sister too, my mum has put them up as she loves them that much. I love getting to meet all the lovely people who are so kind to me all year round as we as a family get to say thank you to them all in person. I had a lovely hand made card off Kevin this month which is so clever and every time he sends me one we can’t wait to open it up to see what it will be. Also, Kim and Stevie sent me some lovely post this month. I’ve had a bad week as I’ve got blisters coming out on my skin and I’ve not been feeling too good, so we have been at the hospital all week, but my bloods have just come back today and they show that there is some infection in there so hopefully I’ll be on the mend very soon. I am running my own night in my guide group this week so it is called ‘all about me’ and I am doing a sensory quiz for all the girls and then they are watching a DVD about my life and then they are going to be writing cards to some of the Pals. I am going to tell them all about Post Pals so I’ll let you all know next time how I get on. Josh and Ruby have just got their school reports and my mum and dad are really happy with them. Josh got an A in his dance exam and Ruby got an award for being the best teachers helper. I just want to finish by saying a massive thank you to Viks and Kate and all the volunteers that work so hard all year looking after us special girls and boys you truly are AMAZING and I am so glad that you are my friends!!! Hi everyone! So sorry for my lack of updates latley! Life seems to roll by so quickly and you don’t realise some days. In the last update i was telling you about Holly’s pain problems that she had developed, so we put a plan together with the Palliative Care team and thankfully the medicine seems to be working by suppressing her brain over night which is stopping all her organs going into spasm, which was causing the pain. Holly has just become a member of her local Guide Group and i’ve got to say it is one of the most positive things that has happened to her as before she had no real opportunity to make friends or join in socially with children her own age. I’ve got to say it was possibly one of the most nerve wracking things i’ve done walking in on the first night with her, as i was so worried if anyone would speak to her or want to be her friend or how she would fit in, but the girls are the nicest group of girls i could have wished for as they have made us feel very welcome and the best thing is that Holly has made friends. We have been battling with all the cold weather lately as it is so hard for Holly to breathe when it is so cold, so we have to keep her indoors wrapped up well, but thankfully we get post to read from all you lovely people which brightens our day. Holly’s health has been quite steady over the last couple of months but each day is different for her. She’s having some problems with her gums at the moment because one of her epilepsy medicines is making them grow abnormally causing her hair to fall out in parts, but she needs it to control her seizures so it is a bit of a catch 22 situation. Josh is still busy being a typical teenager, he seems to love his computer rather than talking to me, but i’m under the impression that it is quite normal for his age!! He has had a bit of a rough period in school in the last couple of weeks as a group of bullies decided to target him and they attacked him in the school yard and he had to go to hospital as they were very vicious. Thankfully he is ok now but as the bruises heal i still find it very hard to understand how other human beings can be so cruel. He has just started his Duke of Edinburgh award with school and is very excited about his first expedition this weekend in the Lake District but not so sure he fully understands how hard its going to be doing a 10 mile hike with his kit on his back, but i know he will love it! He is also still very much involved with the comedy trust in Liverpool and has just helped them secure some funding from the British Heritage Trust to run some comedy workshops in Liverpool which is very exciting. Ruby is growing up so fast and is wanting to do more and more to help to look after her big sister day by day. She spent an hour the other day talking to Holly and teaching her to say her name by breathing a certain way, it was very sweet to watch. She is turning out to be a very creative little girl, any spare minute she has she wants to glue, stick, cut out, make, draw and create. My house is like an art gallery and i’m not allowed to throw out anything in the recycling bin as she says that ‘ mum, it could be made into a car or a swimming pool for my dolls’!! She has a new found interest in Lego which she seems to be really enjoying at the minute. She had been saving up for a spongebob squarepants Lego set from the Lego shop and she finally had enough last week after Easter and so she was thrilled to be able to go to town to the Lego shop. I must say it takes a while to get out of there though as she is busy eyeing up the next piece, which is now a swimming pool with a slide set!! Anyway, thank you all for your continued support to us as a family, it always touches my heart every time i read a letter or card to Holly as i know that other people care. To know you all take time out of your lives to make my children smile is just so lovely and we are very very grateful to each and every one of you! I’m so sorry for my lack of update lately, my health has not been very good over the last couple of months and I’ve been finding it hard to keep on top of everything! I’m hoping that things are on the up now as I’ve started with lots of new medicine so fingers crossed. Holly has had quite a good few months with her chest, she has only had a few chest problems but she is having increasing problems with her bowels and also her epilepsy has suddenly gone a little worse, so we are increasing her medication and are hoping this helps! Apart from that we have been trying to get Holly out of the house a little more lately as the weather is warming up a little. We took Holly and Ruby to see the new Muppets movie which they both loved – Ruby was dancing in the aisles and Holly’s eyes were moving everywhere as I think she loved all the music. Over the weekend it was really sunny in Liverpool which makes it easier for Holly to breathe so we took her and Ruby to see Disney on Ice in the Echo arena and they both dressed up in their princess dresses. I face painted flowers on their faces and we also added lots of glitter which was fun and they both looked like the belle of the ball and thoroughly enjoyed the show. Ruby is very excited for Easter at the minute, she keeps asking me how many sleeps until the Easter bunny comes. She has just learnt how to write her own name and Josh and Holly so she is really enjoying practicing her writing skills and is drawing pictures all the time of her family. She has just started bringing a reading book home from Nursery which has ignited a big love for reading and trying to recognise letters, so when she received her books from Post Pals this month she was over the moon and has taken them everywhere with her to show everyone. She is also desperately trying to find a way to get to Peppa Pig land where Dottie has been as she was astounded that Dottie had met Peppa. Josh has been really busy with lots of school work lately as he is just picking his options and really can’t decide what he wants to be when he grows up. After some thought he suggested he might like to become a zoo keeper, to which me and his dad chuckled a little, but thankfully I think that phase has passed now. He has also been busy with his comedy and has been performing for charity events and gaining lots of experience. Hi everyone, I’m so sorry for my lack of updates. Holly is having (on average) two appointments a day, so tying to fit everything in is proving hard. Holly’s had a stable time over the last couple of weeks and I think the fact that the weather is still quite mild for this time of year is helping. We always find the winter particularly nerve wracking and we find we just keep praying that her chest stays clear each day. Ruby had a lovely birthday in October, she went to our local play centre with her friends and brother and sister for the afternoon, and then the highlight of the day was that she went to the build a bear shop. She got to build her own bear and buy him an outfit which she thought was amazing and strangely enough she has decided to call her new bear sausage roll ha-ha! Josh has been really busy over the last couple of weeks as he has been filming his sky1 program with John Bishop which will be shown at Christmas. He had the most amazing time and met some lovely people so we are all really excited to see him on the television. We have also done some filming for Children In Need this month regarding our local children hospice, Claire House, so that should be shown on the BBC on the night. I just hope they make me look a little younger and hide my bags from under my eyes ha-ha! Holly will be 10 in December and its going to be such a monumental day for us all as we were told that Holly would never see her 2nd birthday, so for her to reach double figures is such a big deal. I’m busy trying to arrange a big birthday bash for Holly, its going to be a fancy dress party with a winter wonderland theme and I want Holly to be the belle of the ball for the day. I’m so excited as it gives me a big opportunity to show off my amazing daughter and tell everyone how proud I am of her and what she has achieved, so I’ll hopefully have lots to tell you next time i write. As always, your kindness is never lost on our family as a whole. The Halloween bags went down a treat and Ruby is still scaring everyone with her spiders! Someone also sent the girls two bears to build and I must say it was a really enjoyable activity for us to do together. Thanks, as always, to Dominic who keeps us entertained with his antics! Ruby also received a present all the way from Stacey in the USA which was amazing! Hello everyone, firstly can I say a massive sorry for my lack of updates, our life has been so hectic over the last couple of months and I don’t even know where to begin. Let’s start with Holly! Well, after Holly having such a bad winter, she had to go in and have an operation to have a portacath fitted into her chest. This is so that the hospital has got immediate access into her veins so they can treat her quickly. That went well and as usual Holly seemed to breeze through in her amazing manor like she always does. It was a little harder for me to deal with at first as I didn’t like the line that sticks out in her neck and I also felt like it was something else which is always at risk of infection, so in turn puts Holly at risk. We then had to start a big battle with everyone. As I’m sure many parents will agree, you have to fight for every bit of help you need and it started to take its toll on me which I have never let it do before, so I was finding it hard to write updates as well as just getting through the day. I’m feeling much better now though so I promise to keep up to date as much as I can. Holly has had a mixed summer, some good weeks and some bad weeks, but in the whole we have managed to avoid hospital which is always a bonus. She got a lovely surprise as her family all clubbed together and bought Holly an IPad 2 with a pink cover, of course! We are still trying to work it out and learn about buying good applications for her for it. She has also got lots of her favourite films on there though which is great. We are just trying to find an arm that will hold the IPad and attach to her wheelchair so she can watch as she travels! She is such a princess but I must say Holly has been stuck in a lot over the summer. The one thing that helps her to get through is all the wonderful post she receives – from letters, postcards, parcels; it is all so uplifting when it arrives and it brightens up her day. I’m still astounded by people’s kindness and the fact that they take the time to care. You are all such special people and we treasure everything that Holly receives. Ruby seems to have grown up a bit over the summer as she never stops chatting and she is always on the go, which is really lovely for Holly as she always includes her. She is in love with everything Scooby Doo and Cars 2 at the moment so poor Holly has to give her a ride around the living room on her chair and pretend she is the mystery machine. She is just about to go back and do her second year at nursery so she is very excited as she will be one of the big girls this year. Josh has also been very busy over the summer as he entered a competition to become Liverpool’s Young Stand Up Comedian of the year and out of 250 children HE WON hooray!!! This was a massive achievement and so now he is doing some performances to help out people and gain more experience, but he’s been interviewed by our local radio stations and also appeared in the local press which has been very exciting for him, so maybe one day he will be following in John Bishop’s shoes!! He has also been keeping up his drumming and has done well with that. We are trying to have some days out this week as a family all together but the weather is not too great in Liverpool so we’ve got our fingers crossed that it brightens up soon and we manage to get out all together and do some fun stuff. Hi everyone Holly had surgery yesterday (had a port put in) and came out of the operation well. She has coped well with the surgery but has come down with a chest infection over night so she’s now trying to fight that off with ivs for the next two weeks. Well, what can I say about this month? I have spent most of it at home as I have not been strong enough to go out yet. My chicken pox have left lots of marks all over my body so I’m hoping they fade soon. My poor brother and sister have been ill as well this month with throat and ear infections which hasn’t been very nice for them. I am at home at the moment having lots of different medication to try and get rid of MSRA. This is because I’m going into hospital on the 22nd of March to have an operation. I need to have a line put in my chest so they can get medicine into me more easily, as all of my veins are not very good at the minute. I’m not looking forward to the op but my mum and dad said it won’t hurt once it is done, so fingers crossed everyone. My dad had a nice birthday this month. We made him a cake which my mum tried her best with, but it wasn’t as good as my dad’s cakes haha! Holly has received some fabulous post this month. A card came all the way from Betty in Australia, we had a lovely postcard from Liz with a picture on so we could see where she lives, a lovely cat card from Jenny, and then all the children received some wonderful personalized Valentine cards! Scott also included some Valentine chocolate which went down really well. Dominic has been really busy again this month with lots of tales and he sent some lovely Winnie the Pooh tea towels. Dottie also sent me a great letter telling us about her passport so we can’t wait to see where she ends up. Jenny sent me a lovely letter with a picture of her Dragon in ‚Äì oh my goodness, Josh loved it and he also thought the paper he received his letter on from Jenny was very cool. How lucky have we been this month as Ruby and I received some lovely teddy bears at the beginning of the month from Jane. Josh was so happy with his camera and photo album from Jillian Malcolm and Angus too and he has decided to save it for a family day out when it gets warmer and Holly can go out again. I’ll post some pictures when he’s done it. Ruby has been very happy at bath time this month as she received some rubber ducks from Jooles, Emily and Daisy. Holly also received a great height chart and some stickers, but unfortunately Holly was taller than the chart, but we had great fun trying to lie it next to her! Penny, I promise to try and grow a big pumpkin. Also, Adam and his mum Lesley sent us some seeds and a lovely foil scratching picture that my dad has been helping me do. The noise and feel is quite funny but it goes through my mum! I also have some different coloured nails this month thanks to Melanie who kindly sent me some new ones and last but not least, I was so surprised to receive a signed postcard from Gordon Ramsey – oh my goodness how fab! Thank you so much Jenny. Also, Ruby and I have made some great badges and my Japanese bookmark is fabulous. Finally, we received another card and stickers from Sophie from Holland – Josh was so happy with AJAX stickers. Hello everyone, well not much to tell you about this month as I have been too ill to do anything. My chest didn’t seem to get any better from before Christmas and then a couple of weeks ago I broke out in chicken pox (for the second time). At first it wasn’t too bad except I was really spotty (I looked like Dottie the Dalmatian haha!) but then I became very ill very quickly so my mum and dad rushed me to hospital in an ambulance again and when we got there the doctor discovered that I had pneumonia again. This time my right lung had collapsed with it and by this time I was vomiting and not feeling very well at all. I was struggling to breathe which isn’t very nice so the doctors said I needed to get a line in quickly so they could get some medicine into me, but the only problem with that is my veins are damaged from all the treatment I have had before so it was very difficult. After 8 attempts and some very sore arms, legs, hands and feet, they finally got one in. The next day was just as hard as I had not been to sleep for a couple of nights so I was feeling very tired and everything was becoming very hard. The doctors came in to see my mum and dad and they were not very positive about me getting better, so my mum sent them away and said that they had no choice but to make me better. That was a very sad day as my mum was crying all day because she was worried and then when Josh came up to visit me after school he was very sad as well so I decided to get some sleep that night and I think that helped me, as after a couple of days and with lots of medicine and lots of physio, I started to breathe a little easier and I could see my mum smiling again, which is always a good sign. My mum and dad asked the hospital if they could bring me home with my line in and look after me at home with the help of the outreach nurses and my chest doctors said yes, as they know I like my own bed much better than the hospital ones as they are a little uncomfortable. So we are home now and slowly but surely I’m starting to feel a bit stronger each day. My consultants think it will take at least 6 weeks for my lung to repair itself so I’m still on lots of different medicine to protect it, but at least I’m at home. My mum and dad keep telling me that I’m a good girl for sharing all the time and I didn’t know what they meant and then they told me that Ruby had caught my chicken pox, so now we are both spotty but at least I know how to share! Anyway I hope you have all had a nice January and I’m really hopeful that February will be much better, as it is my dads birthday so I’ve got to start planning his cake. Unfortunately my mum isn’t as good at cakes as my dad but I can’t ask him to help haha! Thank you this month to Claire for your lovely hand made get well card that must have taken you so much time, I loved the design it is so girlie and pretty. I also received a fabulous postcard all the way from Florida from Liz and hearing about her adventures brought lots of happy memories back for me and my mum when we were reading it. We just hope we get to go back to meet Mickey again one day. I loved my pink spotty card that came all the way from Scotland as well, it’s my favourite colour as you know, I do hope you got your biscuits made in the end Tyrie. Dominic your letters are brilliant – me and my family love listening to your adventures and thank you so much for your gifts that come along as well, we all loved our surprises, thank you. As always, Dottie’s letters make us smile, but I think the snow angel is my favourite. Jenny, I’ve been thinking about your nails for your wedding and me and my mum think a nice French manicure would look lovely on your big day. Thanks for all your lovely words over the last month and showing such care to me, we hope you and Ben are still having lots of fun and my mum can’t quite believe how many animals you have. I love my music cd that Terry made for me too, thank you so much; it is great listening to it with my lights on. Penny, thank you so much for the paper mache pig, me and Ruby are going to enjoy getting messy with that as soon as I feel up to it. Thing have been very bleak this month and some days are harder than others, so when you receive bad news about your child lying there and you know that things are completely out of your control, it is the worst feeling in the world for a parent. Thank you to everyone who sent get well wishes to Holly this past month it has been so hard and when I receive a wish message to know that someone out there cares and is willing her to get better as well, it is just the tonic you need. Joshua and Ruby have just as hard a time when Holly is in hospital as they are passed from pillow to post and not knowing when they are going to see their mum and dad next is really difficult, so when they receive some post and it lifts their day, it is so lovely to see. Thank you again this month for helping to make a very bleak month in our life a lot brighter. Things have been really bad here and we had to call an ambulance on Tuesday. Holly has got bad pneumonia from the chicken pox and her right lung has collapsed. They said on Wednesday that she might not make it, but thankfully she has done what she normally does and turned it all around on Friday. She seems to have turned a corner thank goodness. Anyway, I’ll keep you posted how it’s going. It’s been really traumatic for Josh as well this week as he understands what’s happening so he’s been really worried and asked me to promise not to let anything happen to her. So we are hoping for a better week next week all round. Holly has broken out in chicken pox tonight! Happy New Year everyone! Well what a month I have had since we last spoke. 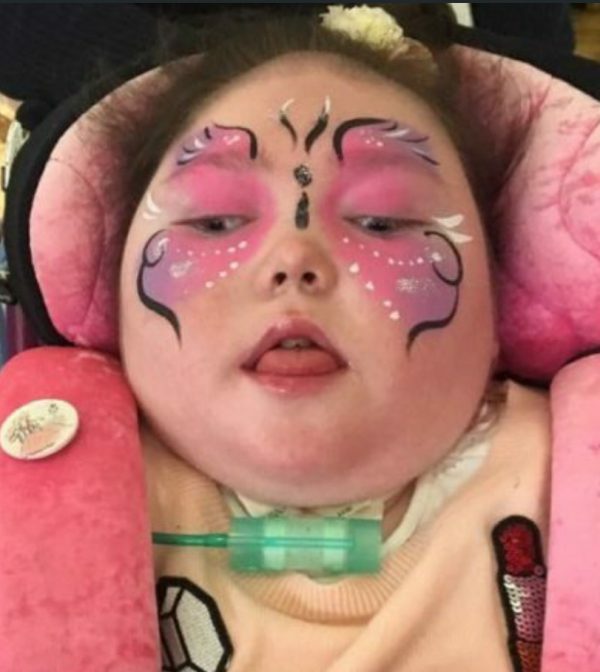 It was my birthday on the 6th December and my mum and dad had arranged for a pony to come to my house with a carriage and I was going to put glitter all over the pony and carriage and then I was going to be wheeled on in my wheelchair and taken for a ride just like a princess. But guess what? It snowed and the party people couldn’t get here so my mum was really upset for me but she quickly put plan B into action and arranged for a lovely lady called Polly to come to my house and do a make over on me and my friends which was lovely. We all had hand and foot massages and we got our nails done and then we finished off with a bit of wheelchair dancing. I had a lovely day and really enjoyed myself but I started to not feel too well as the day went on. By the next morning I was not feeling too great at all so my mum and dad had to phone an ambulance and I was taken into hospital. It turned out I had pneumonia so the doctors put lots of lines in me and started giving me some medicine to make me better. The next couple of weeks were really hard as my breathing was not very good at all and I needed medicine and special massage on my chest and also special nebulizers all the time to help me breathe. My mum and dad asked the doctors if they could bring me home and look after me at home so they said yes and we had some lovely nurses coming out every couple of hours to give me iv medicine and to check I was ok. It was very hard for Ruby and Josh because my mum and dad were doing everything for me so we couldn’t really go out or do anything, but they never complain. I started to feel a little better just before Christmas but then on Christmas Eve I was not good again so we had to call the nurses back and it all started again. I slept for most of Christmas day but when I woke up I was so excited because Santa had been and left me lots of surprises which Ruby was desperate to help me open. I also got lots of lovely post while I was ill in bed and it was such a treat as the days can be very long when you are not well but too ill to get up. My sister and I loved all our reindeer letters – we loved hearing what they were up to and Ruby was so happy when she found a chocolate coin in one of hers. Things are still a bit tough as my epilepsy has gone bad again now because of my infection, so my mum and dad have to keep giving me my emergency medicine, but my consultant said I should start to feel better soon. I hope so! While we were at the hospital yesterday, he told me I have to go in soon to have an operation to have a line fitted in my chest so they can get medicine into me more easily. I’m not looking forward to this but my mum promised me it will all be ok.
Josh and Ruby wanted me to say thank you to everyone who made our first Christmas with Post Pals so special. You are all very very very kind and we all really appreciate it. So, for now, I hope you all have a good month and I hope next time I write I’m feeling much better. Holly was rushed into hospital today with a bad chest and she is on HDU. My mum wanted me to say thank you to everyone who sent Holly lovely birthday wishes. Well, what a great month of post I’ve had. Firstly I saw myself on the newsletter then I have received some lovely textured paper from Penny which I’m going to use to make some Christmas cards with I think. Then one cold day a parcel arrives for me, Josh, and Ruby, so we had to wait for Josh to come home from school which was really hard but it was well worth the wait as it was full of chocolate. Josh couldn’t believe his eyes ha-ha! Then to top it all off some gorgeous bobbles and hair bands arrived which I really love as some of them jingle so I’m going to wear them to any Christmas parties I go to. My health has been quite stable this month so I feel really lucky as Ruby has had a bad chest infection so my mum has been keeping us apart to try and make sure I don’t catch it. I hope my health stays well as I’ve got a big week coming up as its my birthday (hooray!) and I’m going to be nine – which considering the doctors said I wouldn’t make my second birthday, it really is a day to celebrate. My mum and dad have said they have got a big surprise for me but they won’t tell me so I’ll let you all know next month how my day goes. Anyway, I hope you all have a magical Christmas and you get all that you wish for. I’d like to say thank you in advance to you all for taking the time to keep in touch with me. Sometimes when I’ve been up all night with low oxygen or I’ve been fitting all day, it’s such a treat to listen to all your stories and open all your very kind gifts. All of my family send their love too. My brother Josh is doing his first stand up comedy performance in a restaurant where we live soon too so I’ll keep you posted as to how he gets on. I received a lovely postcard of Dottie this month (I love hearing about all of her tales) and the lovely Kate sent me a card with lots of cupcakes on which me and dad thought was great. I was so happy to see myself on the Dottie newsletter, how exciting was that! I have shown all my family. Christmas has also well and truly started in our house with Ruby’s reindeer letters arriving, she gets so excited and now comes back from nursery every day and asks if Father Christmas has sent any post again ha-ha! Wow what a gorgeous sticker book I received this month too from Lianne and Craig, thank you so so much. Post Pals has put a real sense of excitement and joy into our house, so thank you to everyone, you are all wonderful people. Well what a lucky girl I’ve been this month to receive such lovely card letters and gifts. October has been really busy as I have had lots of hospital appointments so its always nice after a long day at the hospital to come home to some lovely post to read to cheer me up. I had my little sisters’ birthday party to look forward to this month and we had a great day at her Toy Story party. My mum painted my face with pretty flowers on and lots of glitter and my Auntie Rach got dressed up as Jessie from Toy Story and surprised Ruby with a Barney the Dinosaur cake which I helped my dad to make. Unfortunately I had a big fit half way through the party so I had to sleep the rest of the party but I had a really good time while I was awake. My new medicine is helping me lots with my fits now. I don’t know about anybody else but its gone really cold up here now so I’m finding it hard to get out as much now as I struggle with my breathing when its really cold, but we did go to the cinema the other day because its nice and warm in there. I also entered a completion at my children’s hospice to have my picture used on their Christmas cook book which was a gingerbread man made with my finger prints and guess what – I WON! Hooray! So I had my picture in the local paper with the chef Marco Pierre White which was a nice treat. Anyway, this month I’ve got to start thinking about my birthday as my mum is wondering what we can do for the day. My mum is looking at special treats for me to do so I’ll let you know in December. Holly received a letter all the way from America this month from a very kind person called Karli and she loved her stickers, we have put them around her notice boards. Also Ruby and Holly love to hear all the adventures of Dottie and all the family. We also love to see Hello Kitty landing on the door mat. Oh my goodness how lucky has Holly been this month! She has received some lovely gifts. Claire sent her a fabulous story CD which we have listened to lots, and then we had an amazing pair of panda bears that say ‘I love you’. Holly has responded really responded to them and we put the panda around her hands and she likes the vibrations from them. Best of all they came all the way from China so a big thank you Liz for thinking of Holly. Then along came Halloween and I must say there were lots of screams coming from our living room as Josh was chasing his sisters around the living room with his scary spiders. Sarah, thank you for putting so much hard work into Holly’s Halloween card, she loves feeling lots of different textures. Again a big thank you to everyone who has thought about me and my family this month it really means so much. I know my mum would love to reply to each and every one of you personally but I need lots of care through the winter so my mum dads’ days are really long looking after me and my brother and sister. She wants you to know she really appreciates everything. I started September quite well and me and my mum went on a face painting course together which was really fun, but my mum keeps painting my face now! My favourite was a Hello kitty design. I also got invited to a special night by Liverpool fire brigade, as they wanted to present my children’s hospice with a great big cheque, which was lovely for them. However, as the weather seems to have got colder, my chest has been quite bad lately and I’ve also had lots of problems with my epilepsy, so my mum and dad took me to hospital where the doctor has given me 2 new medicines to try which seem to be working at the moment. It has been hard for me to get out of the house over the last couple of weeks, so I’ve been keeping busy at home doing lots of baking with my Dad, and I’ve also had lots of manicures which has been really relaxing. Josh and Ruby have also enjoyed eating all the cupcakes. Both Josh and Ruby have loved receiving their special letters and gifts too, so they wanted me to say a big thank you to everyone for them. I have just finished off September with some really bad news, as one of my friends has just gone up to heaven and I am going to miss her lots. Post Pals has made my weeks a lot brighter though, it’s so exciting for me and my brother and sister. I received lots of gorgeous hand made cards which must have taken so long to make, so I want to say a big thank you to everyone who sent me cards. I loved reading lots of interesting and funny letters this month too – I love hearing all the tales that Spotty’s sisters and brothers are getting up to and I also got a lovely picture of Barbie sent to me coloured in so nicely by Jodie. I was so happy to receive such lovely thoughtful gifts from all the kind people this month. Sarah made me a lovely door plaque with my name on and I listen to my personalised princess CD almost every day – my favourite song is Beauty and the Beast, I think. I have had lots of messy time over the last couple of weeks and we have lots of birthday cards to make for our family so it has been fun. I hope you all have a great October – I’ve got my little sisters Toy Story birthday party to look forward to so I’ll let you know how it goes next time.